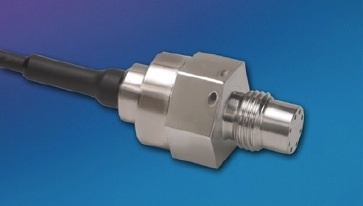 The HKM/HKL-233(X)-375 is a miniature threaded pressure transducer. The hexagonal head and o-ring seal make it easy to mount and simple to apply. The HKM-233(X)-375 utilizes a flush metal diaphragm as a force collector. A solid state piezoresistive sensing element is located immediately behind this metal diaphragm which is protected by a metal screen. Force transfer is accomplished via an intervening film of non-compressible silicone oil. This sensing sub assembly is welded to a stainless steel body. The HKL-233(X)-375 utilizes Kulite's Patented Leadless Technology. A solid state piezoresistive sensing element is protected by a metal screen. This sensing sub assembly is welded to a stainless steel body. This advanced construction results in a highly stable, reliable and rugged instrument with all the advantages of microcircuitry: significant miniaturization, excellent repeatability, low power consumption, etc. The miniaturization process also yields a marked increase in the natural frequencies of the transducers, making them suitable for use even in shock pressure measurements.